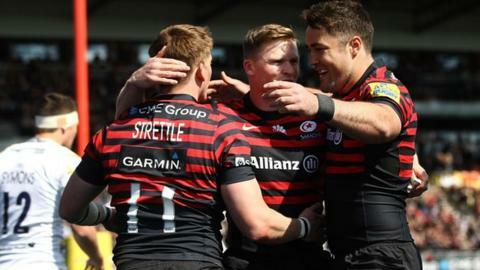 Worcester Warriors' relegation back to the Championship was finally confirmed at Allianz Park as they were outclassed by Premiership leaders Saracens. Flanker Jackson Wray claimed a hat-trick, Chris Ashton scored twice and David Strettle all crossed for Sarries. Worcester full-back Chris Pennell did his chances of being voted Premiership player of the season no harm with a consolation brace of tries. Warriors' relegation cannot be rubber-stamped until the RFU's Professional Game Board has passed judgement on the Championship semi-finalists' suitability for promotion. The PGB will meet on Thursday to issue a ruling on Friday on whether Bristol, Leeds, London Welsh and Rotherham meet the Premiership's minimum off-fieldcriteria. Semisi Taulava also crossed in a late revival from Dean Ryan's Warriors. But, with Alex Goode claiming a 14-point haul with the boot, Worcester's three-year stay on their return to English rugby's top flight, long expected after just one win all season, came to its inevitable end. Worcester stand-off Ryan Lamb, yellow carded late on for a deliberate knock-on, kicked Warriors' other points, with a penalty and a conversion of Pennell's first try. Heineken Cup finalists Saracens also had winger Strettle and Neil de Kock yellow carded late on as they ended the game with 13 men. Saracens have now surpassed the regular-season record for Premiership points scored, having taken their tally to 602 in 21 matches - an average of almost 30 per game. "Breaking that record has to mean something for us. You've got to be proud of certain things. And for us to finish top of the tree in the regular season again is a good thing. "To have more wins than last year and score double the amount of tries probably on last year, that's a sign of progress. And we're in a Heineken Cup final, which is one step further than last year. "We played Worcester just before Christmas and they are a transformed team from the one we played then. They just seemed beaten before the first whistle, and that team wasn't like that today. They fought for everything. "They've got some real talent if they keep it all, especially in the back line and I've got no doubt they'll come back stronger for this. The last three months they have actually played well. They've got a good coaching team and they'll be back stronger in time." "We're in the Championship now, so we can stop talking about ifs. That's going to drive us on, because it's going to hurt. "There's some big players in that changing room. It will hurt egos, it will test humility and everything else. But it's got to be a driver to ensure we come back to this level." "What's happened to this club had to happen. If we'd survived in the Premiership it would have been tough, because it has to change. It has to go about its business differently. "It has to start growing people, supporting people and people have to come here because it is their club, not a stepping stone or a retirement home. And we'll make sure that happens." Saracens: Goode; Ashton, Bosch, Barritt, Strettle; Farrell, Wigglesworth; M Vunipola, Brits, Stevens, Hargreaves, Botha, Wray, Fraser, B Vunipola. Replacements: Gill for M Vunipola (7), George for Brits (50), Wyles for Farrell (51), de Kock for Wigglesworth (51), Brown for B Vunipola (51), Taylor for Barritt (53), Sheriff for Botha (59), Johnston for Stevens (60). Sin Bin: Gill (33), Strettle (75), de Kock (77). Worcester: Pennell; Drauniniu, Grove, Symons, Lemi; Lamb, Arr; Fainga'anuku, Creevy, Murray, Percival, Galarza, Williams, Betty, Thomas. Replacements: Shervington for Creevy (53), Taulava for Betty (57), Fatiaki for Symons (62), De Carpentier for Williams (66), Andrew for Fainga'anuku (67), Hodgson for Arr (73), O'Donnell for Murray (74), Stelling for Lamb (76).